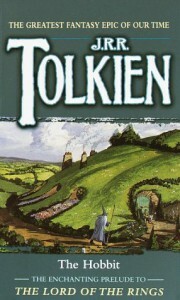 The Hobbit was intentionally written as a children's book, and because of this Tolkien refrains from adding tedious descriptions of such details as what the grass is like as our group of adventurers march along he is fond of in his works for adults. Really, such descriptions are not needed as Tolkien does a magnificent job of transporting the reader into Middle Earth, without dumbing things down for his audience of children. For example, Tolkien briefly describes the personalities of all of the creatures encountered in The Hobbit as if he was a gentle parent reading to his own child, rather than a condescending teacher to a group of students. Because of this style of narration, I find that the older I get, the more I appreciate Tolkien's skill as a writer. It is one thing to be a great author, but another to be a great author of different styles of writing. Plot-wise, I enjoyed the episodic nature of The Hobbit because while each chapter was entertaining, every reader will have different favorite adventures from the next (mine are the unexpected dwarf party, meeting Gollum, and crossing the river in Mirkwood). The only reason I am giving this 4.5 out of 5 stars is that I wish we got to know more of the dwarves, and that evidently in Middle Earth men outnumber women 8 to 1, so there was no room for female characters in The Hobbit!